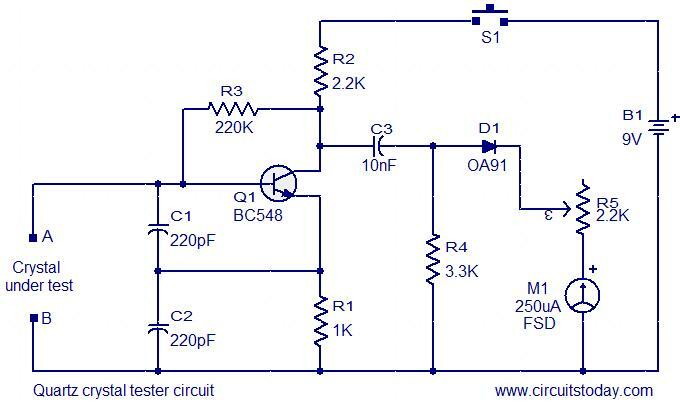 This a very simple and inexpensive circuit that can be used to test quartz crystals.Here a Colpitts oscillator is wired used the transistor T1.When the crystal is connected between terminals A and B the circuit will produce high frequency oscillation.The oscillations will be generated only if the crystal is a good one.The diode OA91 will rectify these oscillations and it can be visually identified from the meter.The deflection of the meter will be directly proportional to the activity of the crystal. The push button switch S1 can be used as an ON/OFF switch. The meter M1 can be aÂ 250uA FSD ammeter. POT R5 can be used to adjust the deflection of the meter. The crystal to be tested can be connected between terminal marked A and B.